Runs under OS X and OS 9. Full version with save disabled. Automatically quits after ~ 25 minutes. 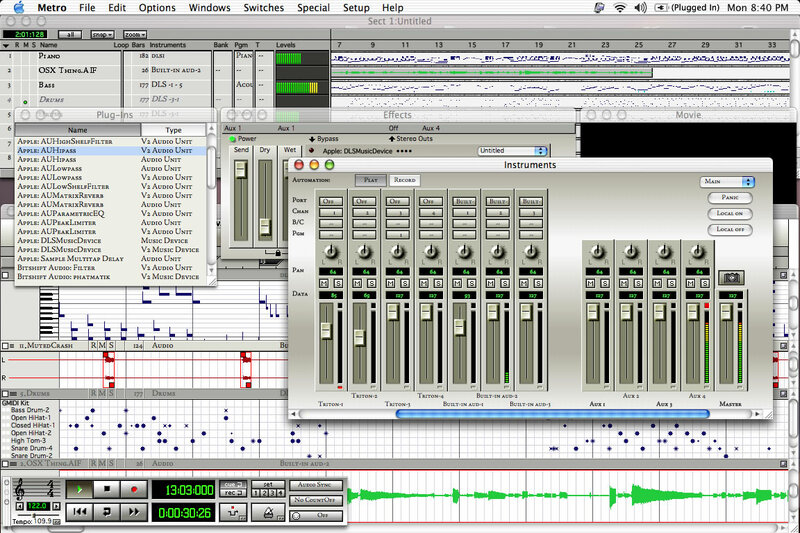 Metro is an audio sequencer that is designed to handle various types of audio productions. It works as a stand alone application with integrated MIDI, audio and video production. It also boasts of an easy to use interface. Metro supports up to 64 audio tracks with each track having its individual effects assignable. Eight aux busses are also supported with their own effects chain. You can stack up VST effects and/or AudioUnits (for OS X only) including VST 2.0 plug-ins. Real-time editing is possible and even recommended since the original audio is recorded regardless of the effects used via the Software audio play-through feature. Download.Mid files from the internet and print beautiful standard music notation scores in large or small notation sizes. Create complete musical pieces from inspiration to MP3 (or dozens of other audio formats). Play guitar live through an amp-simulation plug-in, record the dry audio signal and MIDI controllers (such as wah) for easy editing later. Use Rhythm Explorer to create unique and amazing algorithmic drum patterns, bass lines, guitar strums, piano and other parts or complete tracks. Batch convert audio files between many different formats. Try out plug-ins freely available with complete support for VST and Audio Units. Score a soundtrack with synchronized audio to a Quicktime Movie. Import sequences from external MIDI devices using MIDI synchronization or select sounds on external MIDI devices using program names. Record multiple tracks of Audio and MIDI for hours. Share documents written on a Mac containing compatible cross-platform VST's with Windows users without modification and visa versa. Add lyrics to MIDI files in preparation of karaoke. Enhanced the stability and usability of the Ultra Rhythm Explorer window. Other minor enhancements and stability improvements. Using the input and output contextual submenus it is now possible to follow a track insert plug-in to a different section. ‘Save and increment’ in the switches menu. For VST plug-in’s without version resources, the version number is inquired upon instantiation via effGetVendorVersion. Automatically set the initial category of a VST plug-in when it is instantiated for the first time, if the plug-in includes a category. Remote Control events are now in three user selectable and independent categories. Default number of undo steps increased to 48. Double-clicking on the punch-in or metronome buttons in the transport opens the respective dialog. Rescan audio devices in the Digital Audio setup dialog (New for Windows only). The onscreen keyboard window step velocity is saved with the Metro document. Contextual ‘View’ menu in the mixer window allows mixer channels to be viewed via ‘Show All’, ‘Hide MIDI’, ‘Hide Audio’, and ‘Hide Selection’ commands. Mixer Channels can be rendered via the Mix Or Render Tracks dialog. Background color for continuous data view can be specified in the general preferences dialog. Swing is ignored if the quantize is a quarter note or greater. Plug-ins with no GUI look better in the plug-in rack. Menu item to add ‘new aux buss’ in the output popup of the instantiated effects window. Help tags for the keyboard window. Supports songs with measures counting to above 9999. Cursor will show you what will happen with a mouse click in the Graphic Editor. Sagan Technology Metro 6.5 has been strictly designed with two primary engineering objectives; stability and performance. Sagan Technology is very conscientious that their software be bug free and is open to user feedback. When a bug is reported it is quickly fixed and a new version is made available in a timely manner. Version 6.5 is the first version to bring standard music notation to the Windows version. It also adds quite a few new features including the new spray paint tool which allows the user to create notes in the scale of the user's choosing by simply dragging and dropping the scale. The duration can be fit to the drag or fixed with a specified amount of swing. Another mode of the spray paint tool allows cloning of a copied phrase with transpose in a given scale. The real-time arpeggiator has been rewritten and now has up to 32 steps per pattern. Also a fourth row has been added to the pitch, duration and velocity rows, that allows for user specified chord combinations to be played at each step. In its default mode, the arpeggiator allows the user to play normal keyboard lines while the arpeggiator is still active. Import Lyrics file option allows the importation of lyrics as lyric markers. The lyrics are automatically aligned to notes on the current track. Lyric markers can also be re-aligned by right-clicking and dragging a lyric marker to the correct location. All other lyric markers on the track are then aligned to notes accordingly. New option for selecting the marker type (Lyric, Marker or Copyright) in the marker edit dialog. New option added to the Duration Dialog for scaling duration. Chord quantize added to quantize dialog allows user to quantize chords without changing the relative positions of the notes inside the chords (Full version only). Step duration and options (triplet, dot, etc.) now saved with Metro document. Limited support for VST parameter display mapping since few to no plug-ins support it. New dialog box (windows only) detailing timing info on why Metro stopped when 'strict plug-in profiling' option is selected. New plug-in option 'Resume Before Program Change' required for some GSI plug-ins (like KeyPerformer) to behave. Help tags (new for windows only). New drums are automatically added when notes are entered and the track is in a drum display mode. New option for automatically starting automation record when record is pressed, in the record setup dialog. Missing plug-in are not removed upon instantiation of a new plug-in, so that one can use the change ports dialog to assign all of the other tracks in a multi-timbral setup. New option for showing 'all file types' in the open dialog. This makes it easier to open cross-platform documents that do not have the correct Mac file type or Windows file extension. Mix file type and sample bits are now saved from the mix/render tracks dialog. A couple of new items have been added to the track contextual menu.